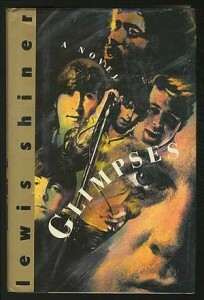 Glimpses, Lewis Shiner, William Morrow & Company, 1993, ISBN 9780688124113, 331pp. Jill likes this folk song that is quite appropriate for our generation. The song, written and sung by a Gen Xer, tells about how all the Baby Boomers tell her that “it must be sad to have been born a little late.” Being born late, the Gen Xer missed out on so much: the Summer of Love, Peace Marches, etc. The Gen Xer thinks this is a load of crap and wishes the Baby Boomers would just get over it (and grow up, for chrissakes). I’ve expressed a similar sentiment before in these pages, but directed at the generation before the Boomers and their fixation on the crash of the American Pie and the loss of Valens, et al. So when I say that I found this Boomer book–about how the music and culture of their collective childhood was so great–fabulous, you know that it faced a tough audience. Glimpses does not hide the fact that it is about the 60s and rock music (given the demographics of the population, probably wise–there are a lot more reminiscing Boomers than fed-up Xers), and I likely took my time turning to it because it wore its influences on its jacket. I bought the book when it came out because I knew Lew Shiner from Austin and had all his other books. Lew’s previous novels are kind of a mixed bag. His first, Frontera, was published by Baen, not your usual source for quality literature, and while enjoyable enough at the time, I’m not sure that Frontera has weathered quite as well as its cyberpunk contemporaries. In his second novel, Deserted Cities of the Heart, Lew’s style and subject matter improved tremendously. In my internal cataloging schema, I tend to group Deserted Cities of the Heart with Pat Murphy’s The City, Not Long After and Karen Joy Fowler’s Artificial Things. See the paradigm shift: from Cyberpunk to feminism in one novel. Deserted Cities of the Heart was still genre, however, and Lew totally dispensed with that in his third novel, Slam. It’s not quite correct, but the voice in my head associates Slam with the line in Michelle Shocked’s “Anchorage” that goes “what’s it like being a skate-boarding punk rocker.” The writer’s progress in the three novels is readily apparent, and I liked each succeeding book much more than its predecessors. But there was still that jacket painting of Jim Morrison, Brian Wilson and Jimi Hendrix prompting the irrational knee-jerk response. Several things finally broke through my resistance, including Glimpses winning the World Fantasy Award, unsolicited comments and recommendations for the book from several First Impressions and Rondua members, and then it appeared in the middle of all the Anthony Powell that Alexandria Digital Literature recommends that I read. A long plane trip to New Jersey was the final straw. I started reading it hesitantly, then slowly relaxed and started enjoying it rather than dreading it. By the time I got to page 50 I had to close the book and let the wave of “good vibrations” flow over me before continuing. It did not matter that I had waited three years before reading this–everything was alright in the world because I was only a sixth of the way into a book that I knew was my type of novel and I did not have to worry about stopping reading for at least 2,000 miles. Glimpses is about the late 60s, but it is much more about the late 80s and one man’s relation to both decades, his father, and his wife. Ray Shackleford repairs stereos in Austin, his father has just died, and he is starting to realize that his marriage is falling apart and that he is an alcoholic. Escaping from it all, he sits in his repair shop imagining what things would be like if things had been different. If he could have understood his father. If the Beatles had not broken up. If that aborted session that would have been their last studio album had actually come about. And then there it is, coming from his radio: “The Long and Winding Road.” But not the over-produced, orchestrated version that we are familiar with, but a more basic version. Something that was not supposed to exist. It is a fantasy novel, no doubt about that, but the ready acceptance of the fantastic by the characters means Glimpses is more kin to Jorge Luis Borges or Jonathan Carroll (i.e., magic realism) than Raymond Feist or David Eddings. While the fantastic elements are fun and Shiner does a superb job of re-creating the atmospheres of the recording sessions, it is Ray, his friendships, and his family relationships that drive you to keep reading. Before you are halfway through this novel, you want happiness for Ray, but know that there will be a lot of pain and suffering before he will achieve peace. And you know that his power to re-create music that never was will be as much a danger to him as a gift. Glimpses has my highest recommendation, and given a sufficient waiting period, will likely be on my list of Top 10 favorite novels.